To finish out our week of cookiescookiescookies, I’ve partnered with the Harmons bloggers to present a Christmas cookie post! We gathered a while back to share holiday cookie recipes and have a little tasting party. It was a sweet afternoon of sugar and spice. Have you ever made a macaron cookie? My friend Caroline is an expert at macaron making. 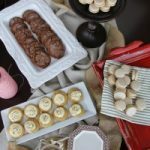 Her Pumpkin French Macaron Cookies are amazing! Such a fun addition to your holiday cookie platter. And the flavors! They taste just like the holidays. Becky, from Vintage Mixer made Frosted Honey Christmas Cookies. They reminded me of a recipe that would have been passed through a family, hand written on a 3×5 card, and tucked away in a recipe box! I loved the way Becky piped the frosting on this simple and not overly sweet cookie. Jesseca at One Sweet Appetite was on Channel 4 News in SLC recently, and shared her recipe for these oh-so-darling Melted Snowmen Cookies. Wouldn’t your kids love these? They’re almost too cute to eat. The Harmons bakers shared their recipe for Peppermint Ganache Cookies. If you’re a peppermint lover, make sure to check out this recipe! Also, if you are looking for a special ingredient for your holiday baking and can’t find it, the amazingly helpful employees at Harmons will special order it for you. For my contribution to our cookie-fest, and to end our week of Christmas cookie posts, I baked up a ginger cookie with a special twist. The best kind of twist. What could be more wonderful than a Chewy Chocolate Ginger Cookie? This recipe comes together in just a few minutes and is what I call a pantry-ready cookie, meaning most of the items for this cookie are probably already in your pantry. Or in your mom’s pantry. My family is officially addicted to ginger and chocolate. Place butter, oil, sugar, egg, molasses and unsweetened cocoa in a large bowl and beat together until blended well. Mix remaining dry ingredients into wet ingredients, if using a mixer, this should be done on low speed and take about 10-15 seconds. Form dough into balls using a 2 inch scoop. Roll in granulated sugar. Place on ungreased cookie sheet. Crowd cookies together on one cookie sheet and place in fridge for about 30 minutes. Place cookies on cookies sheets (about 6-8 per sheet) , and slightly flatten with palm of hand. Bake for about 8 minutes or until set. The cookies will flatten as they cool. Sprinkle with additional sugar after removing from oven. I love ginger cookies Si. I'll have to try them with the chocolate twist. They're so pretty for a drop cookie. I’m making these cookies right now, and four teaspoons of baking soda sounds like a LOT of baking soda. Is that a correct measurement? Hi Lori, Sorry I missed this comment earlier! no typo. One tablespoon plus one teaspoon or 4 teaspoons. Thanks!